To point out the obvious, every NRL side in the competition has a wealth of young, up and coming talent. The issue every side faces is being able to identify that talent. Who should they hold onto? Which ones should they let go? Without a doubt it's a fine line, an art form that even the best talent scouts get wrong on a regular basis. There is no real indicator, no fool proof plan that can easily identify what the future holds tomorrow for the young stars of today. A child hood prodigy and the skills they possess at a young age doesn't automatically mean that his ability will make the transition from a junior level to a senior level, especially when faced against men who are the best in the business. In the same token, that kid everyone thinks is average- at-best at junior level, could well be a late bloomer in the waiting. Even if you had the ability to determine which players would be valuable acquisitions to your playing roster, you're still faced with many hurdles that present more unknowns over their future. These factors can include, but are not limited to; injury, homesickness, off-field indiscretions, player and/or coach clashes, self-confidence, physical and/or mental well being. No club is immune to getting their decisions wrong when identifying talent and it's not uncommon to see young players leave a club they've grown up with in search of greener pastures and in the process finding a club that reaps the rewards of unlocking a wealth of talent. For those players that clubs make the correct call on, nurturing them as they grow, not only as a player but also a man, is critical to their development. The NZ Warriors have never had a shallow pool of talent when it comes to juniors and we've seen many leave the club in search of playing regular first grade footy. While it would be nice to hold on to them all, this isn't a possibility. Those who depart the club will always be a Warrior to the fans. Once a Warrior, always a Warrior. 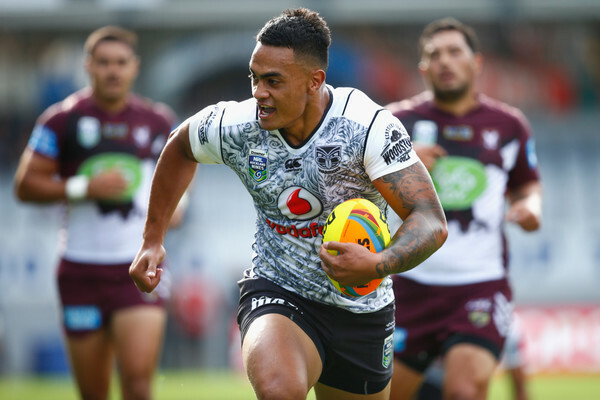 With the withdrawal through injury to Manu Vatuvei and the State of Origin call up for Jacon Lillyman, it was important for Cappy to begin thinking about the future instead of using a band aid solution for the present. While i respect what blokes like Jonathan Wright can bring to the club, i don't believe he should be a player who is higher on the pecking order than our own home grown talent. While he may trump a younger player with his experience, he falls behind with naturally blessed ability, speed and youthful exuberance. The selection of not only Ken Maumalo but also Toafofoa Sipley is yet another indication that our coaching staff may be looking at this team with a fresh approach, which i am sure is music to the fans ears. It is important for these younger guys to be at the top of the list with selections when injury or suspension strikes down a front line player. Slowly introducing them to first grade is the most effective way to introducing and preparing them to the week in and week out rigors that is first grade football. Leaving them to ply their time in reserve grade and picking the "band aid" solutions before them leaves the club in a very dangerous position. We only need to cast our memory back to the back end of 2015 where injury had ripped through our squad and we were forced to run with an inexperienced team. It's counter productive to their development to wait until we have no other options, throwing them to the wolves and letting them fend for themselves. it makes no sense to play them ahead of youth, the clubs future. I'm pleased that Cappy seems to finally be thinking in a similar vein and i can't wait to watch Ken and Toafofoa rip it up this weeekend!